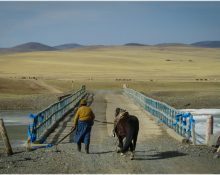 We were travelling through the west of Mongolia with a horseman and his guides back in 2011 – Exploring the beautiful, remote, rugged and stark Mongolian landscape. This was taken at the end of a very long day in the saddle. The horses were as tired as we were! 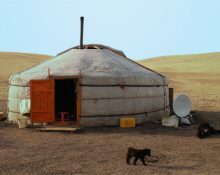 One of the main highlights of our Mongolia trip was staying with the nomads and nomadic families out in the countryside. We’d previously heard that the friendliness of the nomadic people in Mongolia was one of the country’s best attractions! 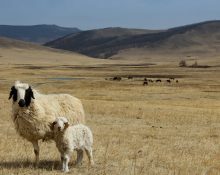 We spotted these woolly jumpers in Mongolia during a 8 day horse trek through the Orkon Valley, some 500km west of Ulaan Baatar. Unfortunately the bigger sheep seems to have lost his front left leg somewhere along the way.